I booked this hunt with Adam Clements, who with his partner Dale Harvey owns the hunting rights to the Lobo and Lolkisale Concessions. 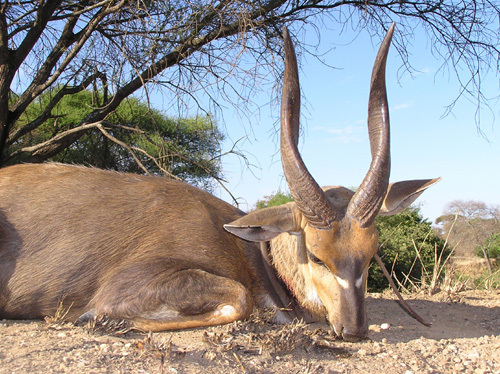 For several years I had been looking to hunt Masailand, and in particular hoping to find an end of the season, short-duration hunt that would allow me to take mature representatives of the desirable East African species. Although I do not consider myself a collector, I fully admit to wanting to complete my trophy room with mounts such as the Lesser Kudu, Grants Gazelle, East African Eland, and Fringe-Eared Oryx. And of course a big buffalo, which the area is famous for. The caveat was that as with all end of season hunts, I had to come on short notice, and be flexible in terms of logistics and trophy expectations. 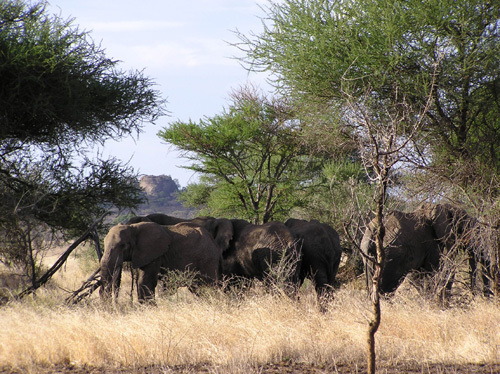 However, I would be hunting in December, which historically represents an excellent time to hunt these areas due to the short rains in November and December that encourage the game in the adjourning Tarangire Park to migrate east from the Park and Tarangire River to better grazing in the hunting concessions. 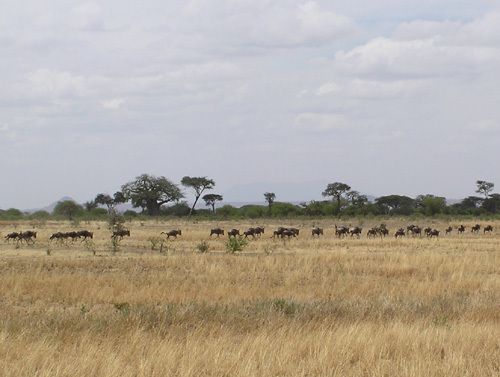 Typically huge herds of Wildebeest, Zebra, Buffalo and other animals can be seen grazing on the lush green plains of Lolkisale during December. I researched the areas and talked to many people and references, including friends here on AR and my PH/friend Peter Chipman, who prior to getting his concession in Zambia hunted the general area many times since the early 90’s. Peter in fact took the huge lion last November (2004) featured in the current Marc Watts “The Main Event” video. Adam and I were in close communications leading up to the hunt, and he answered all my questions accurately, and in a timely and professional manner. Having never been with Bundu, and considering all that Tanzania has to offer an observer, I asked my father-in law Bob along. Bob and I hunted buffalo together 2x2 in the Selous in 2001 with another outfitter, and had a great time. The plan was for Adam to be cat hunting in Lolkisale with a client, while I hunted with PH Brian Van Blerk in Lobo with the opportunity to visit Lolkisale for a few days as schedule permitted. 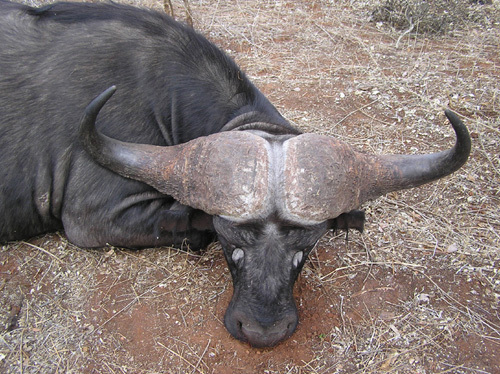 My objective was “big buffalo” and a few representatives of the East African game as available and allowed to take, with the option to upgrade the hunt if a mature, MGM-type lion - significantly better then the one I shot in Zambia - was happened upon. But given the nature of the hunt, I was up for just about anything, and it was great to approach the trip without specific expectations or requirements. Following is my, which ended up being quite a bit longer then I would have anticipated. I enjoy putting these together, as in many ways it helps me relive, sort through and preserve the memories in my mind. At times, this was rather painful to write. However, the articles and reports that I respect most are those written by guys like Harold Wolf of Hatari Times, who has the courage to lay it out there in the open for everybody to see. As such, I decided to provide a detailed and honest account of the hunt, including the phenomenal highs and the gut-wrenching lows. Please bear in mind that I am an optimist by nature, have traveled to Africa before, and that my experiences and perspectives may differ from yours. I would encourage anybody considering a hunt in Lolkisale or Lobo to give me a call to chat. Also, talk with others who hunted these areas recently and at the time of the year you are considering, so that you can form your own impression before making a decision. 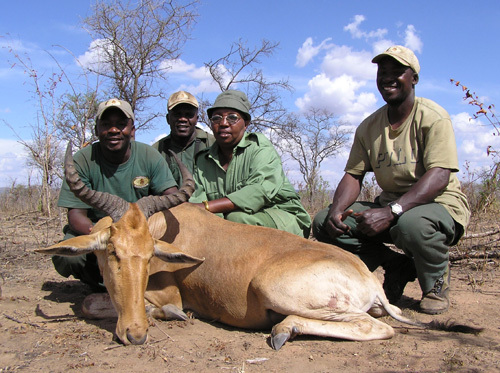 That being said, I highly recommend this hunt to anybody looking for a quality East African experience with a first-class operation, for anything from a 10-day buffalo hunt with a realistic and verifiable opportunity on a 40-45” plus buffalo, to a full-boat classic 21-day safari with lion, leopard and EA plainsgame on the menu. 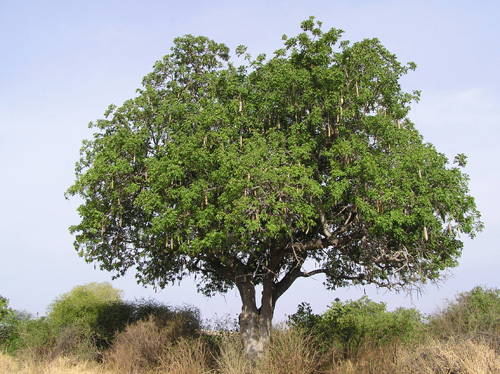 I once again worked with Kathi Klimes to purchase our tickets and select good seats for the KLM flight from Dulles (Washington DC) to Amsterdam, then on to Arusha. Kathi also arranged for our Tanzania Visa’s. The other documentation required ahead of time is a Yellow Fever immunization card (which we had from my previous visit to Tanzania), Tanzania Gun Permit, and the Netherlands Consent Application for Firearms Transport. For these I worked with Jamie from Adam’s office in Texas, who is efficient, friendly and very helpful. On most hunts, I have had to do much of the pre-travel grunt work, and it was a very nice change having a full-service agency handling the details for me, especially considering the compressed time frame. Based on recent experiences of others including Don Causey and Wendell Reich, Bob and I decided to purchase medical evacuation insurance from MedjetAssist (aka MedJet). Although the hunting areas were only a few hours drive from Arusha, I wanted to make sure that the coverage not only included transport from a local hospital back home, but also bush evacuation provided by The Flying Doctors. Jamie was able to confirm with them that in the case of an emergency, the client (or PH) is to call MedJet and they will make the arrangements with their partner in that area, in this case The Flying Doctors. I cheaped-out and purchased the 3-week Short-Term program for $120, noting their Annual Membership Plans are just $205 for an Individual and $325 for a Family policy. Side note that in Zim, one wants to consider the MARS bush evacuation coverage at ~$125/person, which can be purchased in addition to the MedJet. Fortunately we did not need this coverage, but it was reassuring to have. We flew KLM from Washington DC (Dulles) to Amsterdam then to Arusha. The flights were long, but quite painless, even flying coach. The KLM and TSA people in Dulles were friendly, and I had no problem checking my rifles and ammunition through. Incidentally, the ammo was transported in my checked baggage (not with the rifles). The ammo was locked in a hard plastic case with the key attached, and I included copies of my US Customs Form and Netherlands Consent Letter with the ammo and the rifles. I noticed a slight difference in the food and staff between the two legs of the trip, but both were head and shoulders above what South Africa Airlines has to offer. The personal entertainment system on the flight to Amsterdam was excellent, whereas to Arusha it was the old fashioned drop-down screens, which makes this good for sleeping although as the flight lands at ~9pm - the trick is to stay awake in order to get your body clock set to the new time zone which for us was +8hrs. A few travel tips… Remember to jot down ahead of time and carry with your tickets the address that you will be staying at in Tanzania, which is humorous as this will be somewhere in the bush. 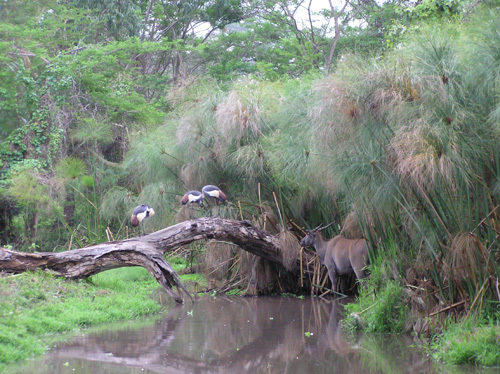 I used Bundu’s Arusha office address and noted the hunting concessions we would be in. For the way home…after checking in the Arusha airport, when flying coach, instead of waiting downstairs in the passenger area, go upstairs and pay the $20 to get into the Business Class lounge. And skip the greasy breakfast and eat at the food court on the second level in the Amsterdam airport, which offers excellent pastries and fresh fruit, as well as a view of the shoppers below for those that have been in the bush too long. Entry into Arusha’s Kilimanjaro Airport was simple, and we were met as soon as we arrived by Bundu’s affable office manager, Peter Larwrece. 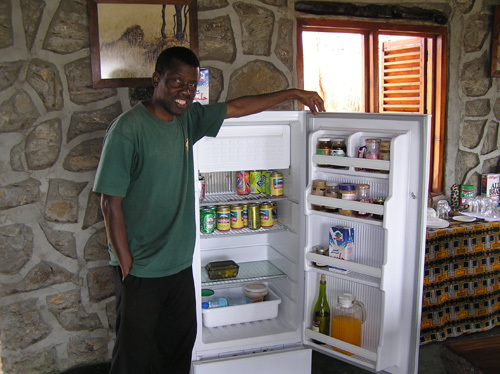 Peter is a terrific guy and an excellent ambassador for Bundu as well as Tanzania. Realizing we were semi-comatosed from the trip, he whisked us through the airport and into the brand-new and waiting Toyota Land Cruiser. 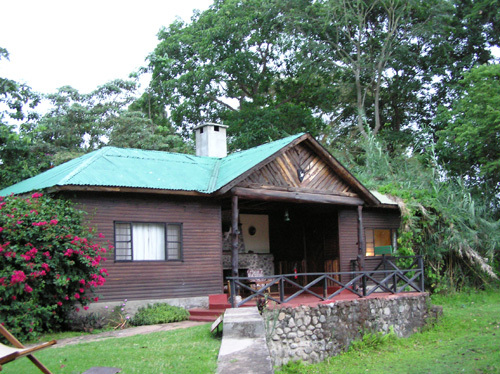 We overnighted at the Mount Meru Lodge and Game Sanctuary, which is located about 10-miles west of town and perhaps a 30-minute drive from the Kilimanjaro Airport. Cost was $135/night per cabin for the “bed and breakfast” service. 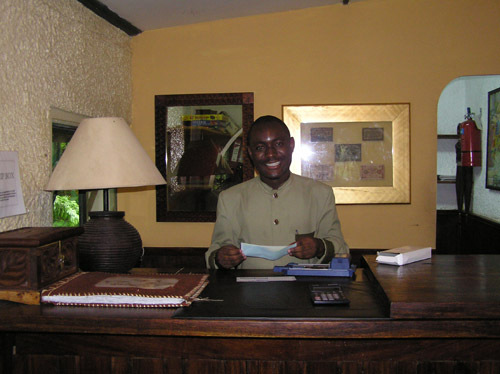 Mount Meru Game Lodge front desk, with typical East African service and hospitality. My cabin, note the tin roof and mature trees which the monkeys loved to traipse around on. As usual, even with the help of a few Ambien, I woke at about 3am and futzed around organizing my luggage and writing in my diary until sunup at about 6am. On one of the travel websites it says “Mount Meru is situated in a Game Sanctuary which provides many of its visitors with their first exciting game viewing experience.” I thought, “yea, right, not a seasoned guy like me”. Well I must admit it was cool watching the animals come down to the water hole to drink, emerging from the tree line and from the reeds on the little island. I must have taken 25 digital pictures of a young Eland bull. 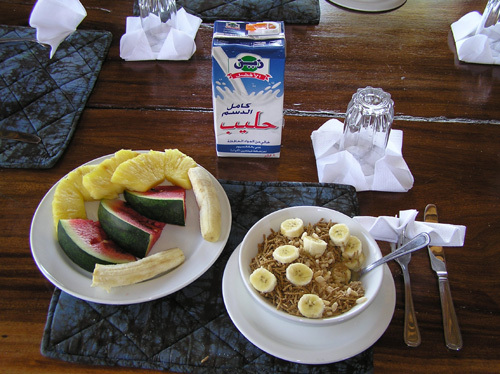 Breakfast was a German-style buffet, and it was here that I began to experience the service and hospitality that East Africa is known for. A young Eland emerging at daybreak from the reeds to at Mount Meru. At 7:30am sharp, we were met by Peter and after a stop in Bundu’s Arusha office we were off to camp. The first hour or so is on tarred roads, while the ~2-3 hour balance is via dirt tracks, noting that Bundu’s new Land Cruiser complete with AC and DVD makes the ride go quickly. When driving to a concession, be it Zambia, Zimbabwe or here in Tanzania, I am always struck at the lack of game, including birds and small critters. For a first-time hunter this must be disconcerting, especially if one still has the idealistic view of what Africa is supposed to look like. It is not until one reaches the hunting areas do you begin to see the animals. And if this does not speak volumes about the value of sustainable sport hunting to wildlife conservation, nothing does. By the time we hit the camp in Lobo, I had come to terms with the lack of rain and vowed to just let the hunt unfold and have trust in my PH that he could find me the animals. As the saying goes, you only need one. As it turned out, this was not a problem and I had multiple opportunities on most all game, including a few chances on slightly better trophies if I had been more patient (although seeing them is one thing, getting this another!). 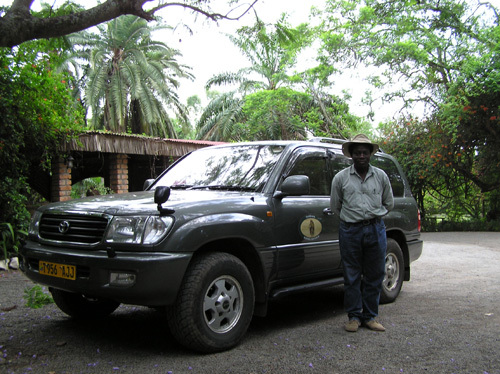 Bundu’s Arusha office manager Peter and the company Land Cruiser. I believe Peter is coming to Reno this year – if you see him please tell him that Bill said “HI!”. 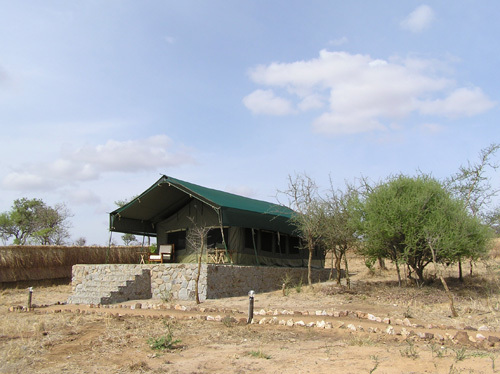 As others on the forum have said, the Lobo camp is brand new and beautifully laid out on a hilltop overlooking the Masai plains. 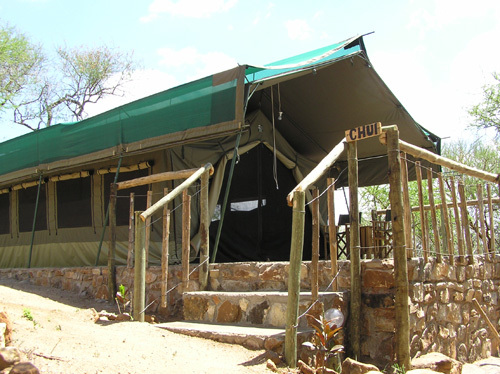 Although I love a tented camp along a river somewhere, this was the nicest permanent camp that I have ever had the pleasure of staying in. The view from Lobo is spectacular, especially at sunset. The tents were very spacious, complete with two single beds and a permanent bathroom and shower complete with hot/cold running water. My father-in law, Bob, who accompanied me on this trip. I hold Bob fully responsible for my African addiction!!! Here we met my PH, Brian Van Blerk and his horse of a tracker, Albert. One look at Albert and I knew I liked him. Brian is from Bulawayo, Zimbabwe, and like other PH’s from Zim who I have had the pleasure of meeting and hunt with, proved to be an enthusiastic and disciplined hunter. Brian and Albert had been in camp since early in the year, May as I recall, and Brian was anxious to get home to his fiancée which I can fully appreciate. Heck, I get a bit “anxious” after a week in the bush! To his credit, he never let this show and although I only hunted with Brian for a day and a half, I am sure had we stayed in Lobo he would have been the ultimate professional. Top-notch Professional Hunter Brian Van Blerk. 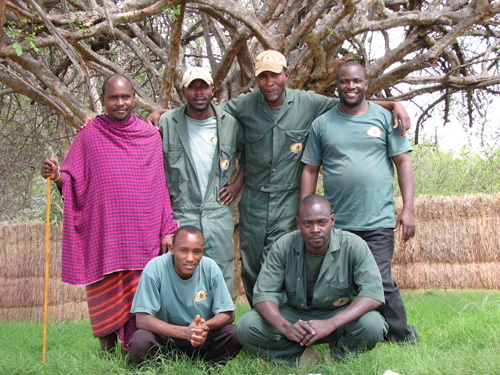 Some of the staff at Lobo, including our colorful Masai security guard. A subject that is often debated and which I tend to waffle on is sharing camp with other hunters. 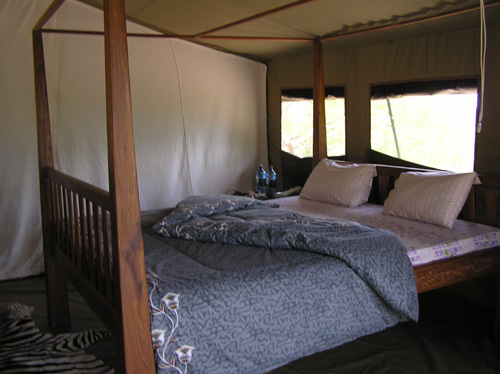 My feeling with an upscale destination like Tanzania, and specifically with a quality operation like Bundu Safaris who owns the exclusive tourist hunting rights to the area, is that one is likely to encounter only first-class people who have similar perspectives and objectives. Often, the person who you meet has considerably more experience then you do. On this trip, I had the pleasure to briefly meet up with Lee Lipscomb and his cameraman “Ziggy” (sp?) of Osprey Film Company. Lee has hunted Africa 18 times and filmed numerous videos, some of which I have sitting on my shelf. 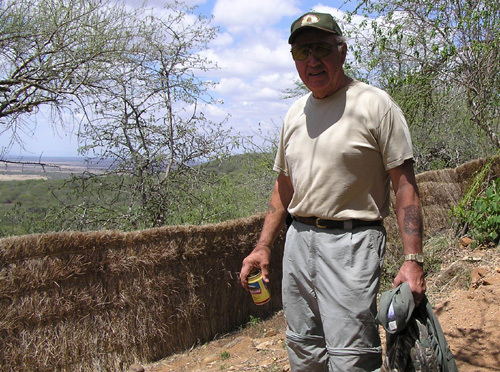 Lee had shot a very nice lion with Brian days before while hunting in Lolkisale, along with three buffalo and some plainsgame including a White Bearded Wildebeest which he needed for his SCI award. Lee was headed back to Arusha with Peter, but I quickly learned that he and Brian had hung numerous leopard baits in Lobo, which is known to be a terrific leopard area, and in fact had what appeared to be a nice Tom hitting one of the baits not far from camp. 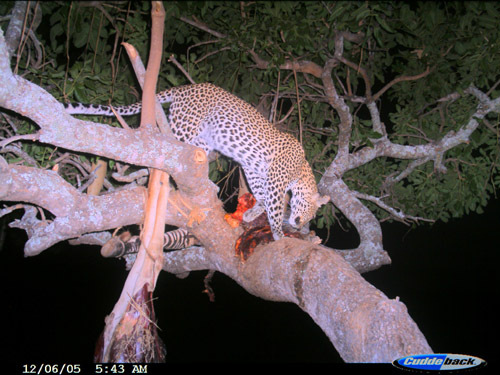 Although I had no intentions of hunting leopard, having shot and full-mounted a nice 7’2” cat in the Caprivi Strip, keeping an open mind I was willing to give it a go. Dinner, sundowners (the sunset in Lobo is awesome), fireside chat, and bed by what would be a late night compared to those that followed, 10am. I did not get to see the entire concession which is some ~700 square miles in size. 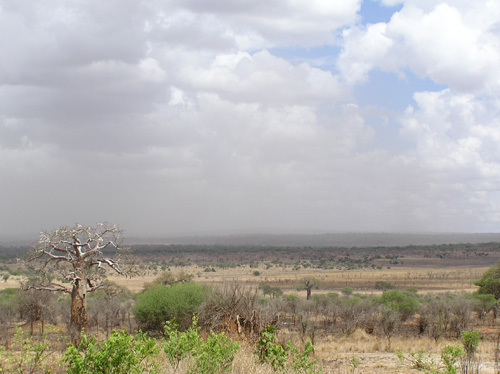 According to Adam, Lobo has three distinct types of habitat: along the ~50km western boundary with the Tarangire Park it is mostly Acacia trees and scrub; the southern area is mostly open plains similar to Lolkisale; and in the east the thorn bush is thick and offers the hands-and-knees type of hunting which Lobo is most known for. I would encourage anybody with specific questions about Lobo to contact Adam directly, as again, we were only there for a short time. Lobo has year round water which by day is used by the local Masai for drinking and to water their cattle. However, at night the buffalo come in to quench their thirst, offering the opportunity to track them first thing in the morning as they make their way to the thick bush where they spend their day resting and feeding. For this reason, Lobo is said to provide more predictable buffalo hunting then Lolkisale, especially August-October before the early rains. I believe the “best” buffalo of the year was shot in Lobo. There are a lot of leopard in the area, as well as lion. However, unlike Lolkisale where the Park lions tend to follow the game out, due to the number of Masai in Lobo they are harder to bring to bait, rarely seen in the day time and do not call as much making them harder to locate. Although one sees more plainsgame in Lolkisale, Lobo is visually interesting and provides the opportunity to track game thanks to the soft soil, versus strictly spot/stalk from the vehicle. The game was a bit more wary in Lobo versus the animals in Lolkisale, but nothing like what I had seen previously in the Selous where they gave you 400 yards and that was it. Typical habitat found in the Loibor Serrit (Lobo) hunting concession. Our first day started with an exciting sprint after a decent Warthog spotted trotting across the trail in front of the truck. Brian and I were fast, but he was faster, and after about a quarter mile we lost him. On the way back to the Cruiser, the bush exploded as we jumped two Bushpigs. I was psyched, as these are still on my must-have list. But it happened too quickly, and I couldn’t get a shot with the .300. A little later we crossed paths with a Honey Badger, which we again tore off after but never caught up with. That’s okay as I had never seen one of these guys, who may be too cool to shoot. Oddly enough, we saw another pair of Bushpigs and four more Honey Badgers during my 1.5 days hunting Lobo. Despite the action, the target of out efforts for the day was to be the Fringe-Eared Oryx. We drove south to where Brian had seen groups throughout the year. The problem was, although we found a nice bull, they stayed in the open and we were never able to get close. Shooting from the truck was not a consideration, so we would drive, stop and “sneak” towards the herd. Watching us, they would walk slowly until we got within ~250-300 yards, at which point they would gallop away, quickly adding distance between us. We would continue “sneaking” (basically walking hunched over trying to pretend not to be humans), and the cycle would repeat itself. We did this for about an hour until Brian and I both decided this was pointless and no fun, and we waved for the truck. Sensing this, the Oryx stopped giving me about a solid 300-350 yard shot. I shouldn’t have, but having faith in my Swarovski 3-10X scope and handloaded 180 grain Barnes TSX’s, and after an hour of cat-and-mouse, I launched one. The shot was a little low and to the left. I immediately cursed myself for attempting it. Continuing to taunt us, and probably expecting a continued barrage of incoming rounds, the Oryx left the plains and headed into the cover of scrub acacia. We chatted a bit, and made the decision to track them. This was great fun, and we actually got up on the old bull which had separated from the rest of the herd. However, he blended in perfectly with the bush and although I could see his white face and horns, I could not determine where his shoulder was, and elected not to fire through the brush. The team was disappointed, but we set off after him again, catching him in the open. As I put the .300 down in the sticks and simultaneously turned off the safety as I had done many timers before – this with a gun that had accompanied me on four previous trips to Africa including this past July, and 18-days in southeast Alaska – it discharged. Thankfully and of course it was in a safe position, but nevertheless it was very disturbing and spooked the Oryx for good. Dejected, we returned to the truck. Unloaded, I examined the rifle and tried to make it fail, but could not. Anybody who hunts knows that often extreme lows are many times followed by amazing highs, and vice-verse. Not five minutes after boarding the truck, Brian slammed on the brakes and said “Oryx”. It was a lone bull standing off in the distance. 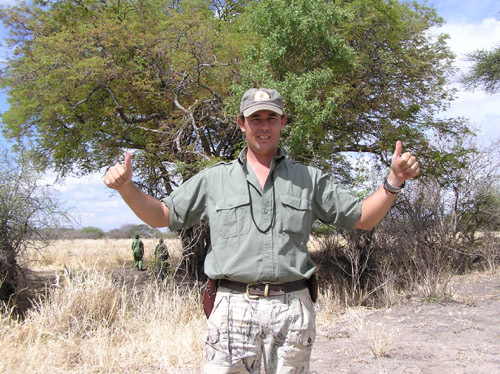 We stalked using a termite mount for cover to within 150 yards, slightly above the Oryx. Carefully I placed the .300 on the sticks and made a good shot through the shoulders. The bull ran off and fearing the worst I fired a long shot aiming for the base of his tail. It hit a bit low but traveled the length of his body putting him down for good. The TSX was later recovered with the picture-perfect “X”, although as the trip went on I began noticing that game shot with the 180gr TSX did not react the same as the dozens of animals shot previously (including this past July) with a 200gr TBBC. Although I like the long-range accuracy of the TSX, I believe I will go back to the TBBC in the future. 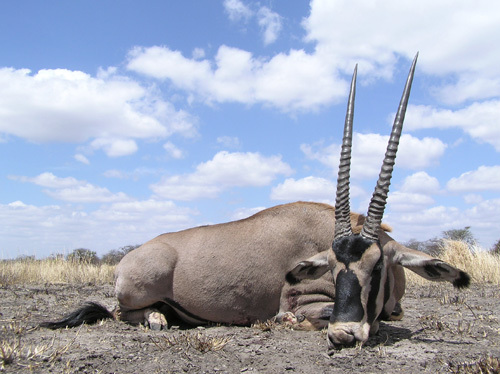 Ranging from northeastern Tanzania and into southern Kenya, the Fringe-Eared Oryx is slightly smaller and darker in color when compared to the “Gemsbok” commonly hunted in Namibia and South Africa. On day-2 we got an early start and drove to the spring looking to pickup buffalo tracks which we could then follow. Just before getting to the spring, the guys spotted a group of five dugga boys walking and slowly feeding in a clearing. We quickly got our rifles and spare ammunition, and ran to the edge of the field. 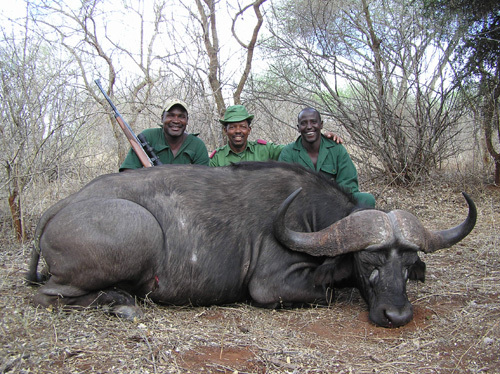 Brian and I had previously discussed my objectives for the hunt, which was to take mature, hard-bossed 40+ inch buffalo. As I had three on license, I had intended to be more selective with each one, ideally getting one of the big boys with the huge boss and deep curl that the area routinely produces. With this bull, to be honest, I never looked at the horns. Brain set up the sticks and told me which one to shoot, and urged me to do so before he left the clearing and entered the thick brush. I was using my Ruger .458 Lott with .500gr Woodleigh soft points (not the protected points) which I have used in the past to take two buffalo, lion and other game. The rifle was topped with a Burris 1.5-6x “Posi-Lock” scope which to date has held up perfectly under the Lott’s recoil and specifically the abrupt acceleration. The shot was much longer then I had anticipated for the area, about 150-175 yards best guess, but with the scope at 6-power I felt comfortable and fired. As we found out later, I hit him low, with the bullet passing below the heart/lungs and fortunately through his right leg before exiting. Side note that I can fully appreciate those who say that for Tanzania at least, a bullet which makes two nice holes (such as Mike Brady’s flat-point solids, which do not feed in my Ruger) is the ticket. Fortunately the Woodleigh did it’s job and we had a very good blood trail to follow. 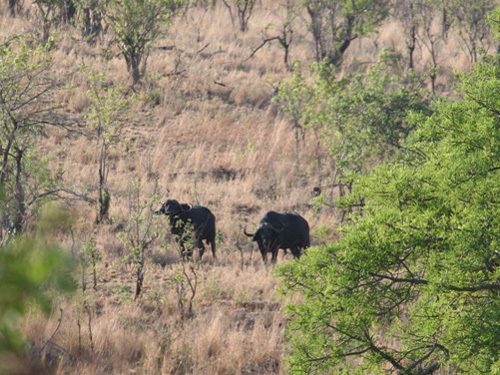 Ideally, I had wanted to track the buffalo which for me is the most enjoyable and thrilling part of the hunt. For better or worse, we were basically doing just that. I always like when tracking the times that I am able to read the spoor. In this case the ground was perfect, and we could follow the group as they ran and later slowed to a walk. Here and there we would see blood on the grass and leaves, which was reassuring as injured buffalo often break off from the others, which may not always be immediately noticed by the trackers. The other possibility when tracking a small group of buffalo, wounded or otherwise, is that they will join up and mingle with a herd. This makes it near impossible to sort out their tracks for any length of time, and often they will separate while you follow the larger herd. But this is what makes tracking fun. After about 45-minutes of brisk walking, Albert spotted the bulls standing in some thick brush staring at us not more then 30-yards away. Seeing Brian raise his rifle, I quickly shouldered my Lott, and with the scope set to 1.5x power, fired at the wounded bull which was easy to distinguish from the others due to the blood on his jet-black coat. He rocked and staggered at the impact, but in typical buffalo fashion turned to run. He only got about 20 yards when he stopped and I dropped his with a high-shoulder shot that broke his spine. Although he was not the bull of my dreams, he measured an honest 42.5 inches (finally!) and clearly was an older bull who had reached his genetic potential, with a decent boss and characteristic white markings under his eyes. A perfect “first buffalo” to take. As Bob, Juma and I savored the moment, waiting for the truck, Adam called on the radio wanting to know if I would mind trading areas and hunt with him in Lolkisale. Going with the flow, I said “sure” and we agreed to meet at Lobo at noon and drive to Lolkisale. A respectable 42.5” Dugga Boy shot on the second day of hunting in Lobo. On the way back to camp, I asked Brian if it was possible to look for Grants before leaving Lobo, as between the two areas Lobo is better for Grants then is Lolkisale. He thought not, but of course we would try. As luck would have it, 5-minutes later rounding a turn we came across a small group of Grants with a very good male leading the way! Afterwards, still uncertain about the .300, while purposely holding the rifle in a safe position and working the bolt ejecting the live rounds, it again discharged this time with a slam fire, and I retired the .300 for the remainder of the trip. From here on I used a camp M70 .300 with an old Leupold 3?-7x scope. It proved to be a reliable, straight-shooting rifle, but I missed the 10x clarity of my Swarovski on the long-range shooting that was yet to come. That afternoon we made the drive to Lolkisale with Adam, which as I recall took about 3 hours, perhaps a bit less, noting we were looking for game on the way. 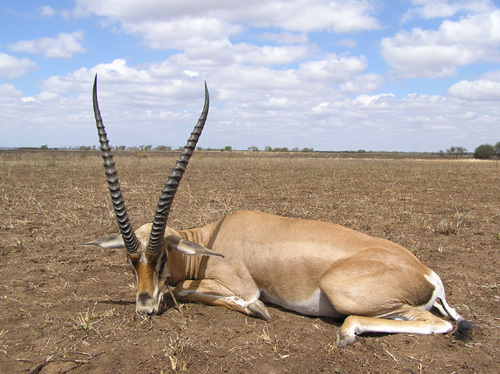 On of the “classic” East African species, the Grants Gazelle is an awesome trophy. This is also one of my favorite pictures. 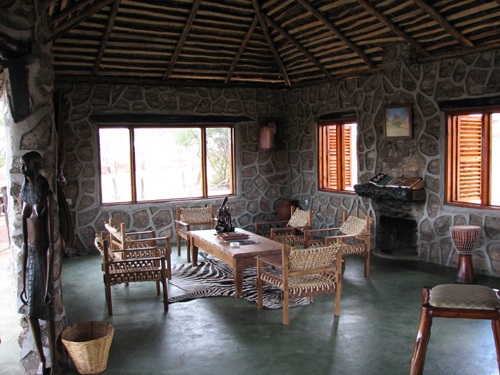 The Lolkisale camp was revamped this year, and is made up of a central dining area with fire pit plus three spacious guest quarters. Behind the main camp are the PH tents, staff quarters and skinning shed. It is comfortable, clean, very well laid out and seemingly well located in the concession. 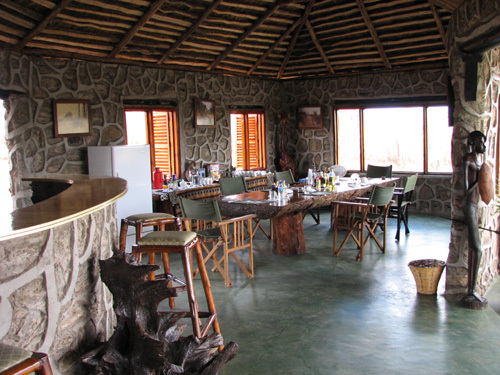 The main dining and meeting area in Lolkisale. One of three guest quarters. The staff at Lolkisale was very professional and courteous, and like Lobo, the meals were beyond belief. Typical dinners consisted of a homemade soup with fresh breads or rolls, followed by the main meal which often included several main dishes such as game meat and chicken or fish, fresh vegetables and a potato or rice. Deserts were excellent, although often I turned these down in favor of a plate of fresh fruit of delicious papaya and mango. This may not look like much, but to me this plate represented a little taste of Heaven each morning. Of course one could opt for as full breakfast of eggs and bacon, or go light with just toast and coffee. 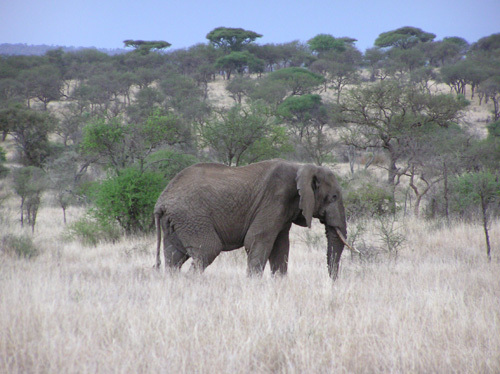 Lolkisale is located north of Lobo, and east of the Tarangire National Park. A narrow 2km buffer zone separates the ~450 square mile concession from the Park for the length of the ~80km boarder. 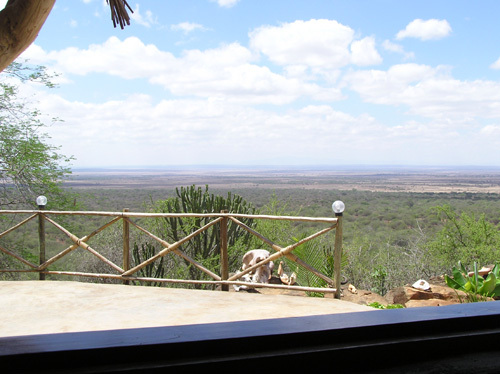 Lolkisale is predominately flat and open, just what one would picture when envisioning classic East Africa. Towards the eastern part of the concession, the terrain is a bit rocky and is where we found game such as the Lesser Kudu and even Klipspringer. 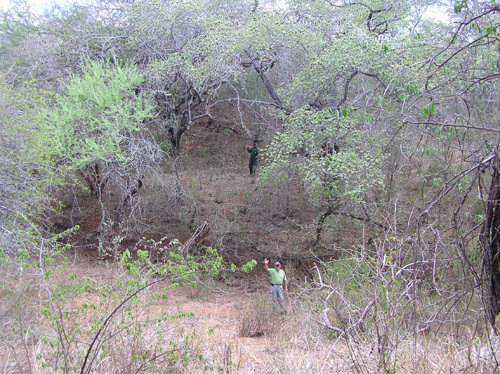 There are small pockets of thick brush, where we hung leopard or lion baits. An awesome view from a popular lookout point. Note the mountains to the north, on a clear day one can see Mount Kilimanjaro off in the distance. Tantalizing showers moving in to camp. 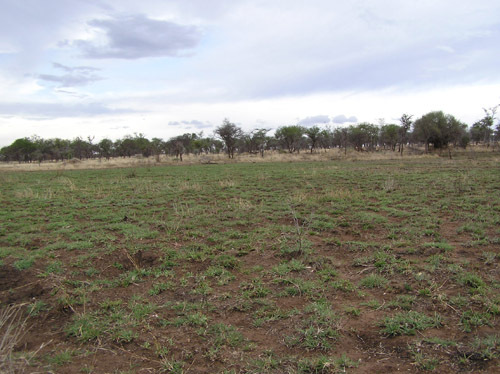 This particular plot of land had showers early in the hunt, and within days new, tender shoots were already sprouting. Neat on TV, awesome in person. My primary team in Lolkisale, consisting of my father-in law Bob Slusser, PH's Adam Clements and Paul Horsely, Videographer Richard, Trackers Doto and Riziki, female Game Scout Ela and driver/skinner. I hunted most of the trip with Adam, who was a tireless companion and excellent host. Adam is a collector himself, and together we took most of the game pictured below. 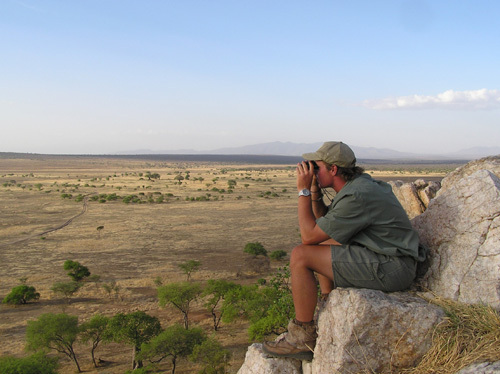 Besides a few hunts per year, Adam is busy managing and expanding Tanzania Bundu Safaris with his partner Dale, and also runs his booking company, Adam Clements Safari Trackers. Adam’s lovely wife Chantelle came to camp for a few days prior to their departure to Zimbabwe where they were to spend Christmas with her family. 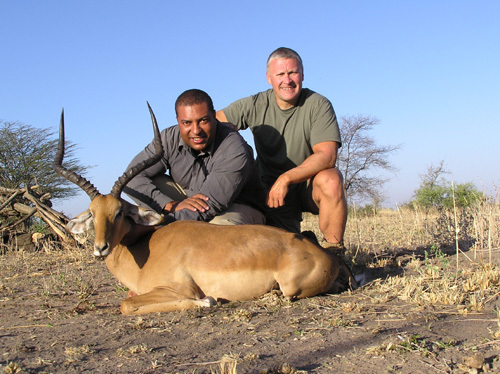 As such, I had the opportunity to hunt with Paul Horsely, who was born and raised in Lolkisale. Although not chatty, I found Paul to be an honest and sincere person as well as a very good hunter. Paul is extremely easy to talk, knows the area and people well, and seemingly enjoyed putting in 12-14 hour days trying to get me on a big buffalo. I instantly hit it off with Paul, and hope and plan to hunt with him again. 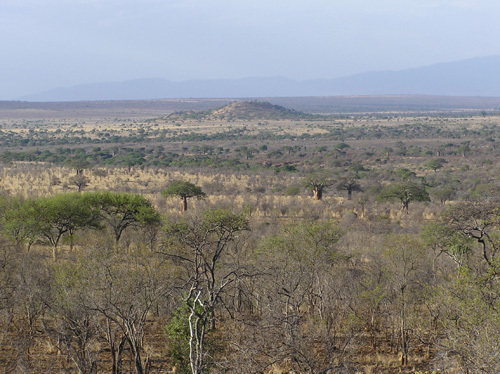 Anybody who has visited Lolkisale has most likely been atop “Sunset Hill”, which offers a stunning view of the surrounding savannah. When the wildebeest are migrating, one can see thousands of animals below. I hope to see witness this on a future hunt. In the picture is Richard, who was doing some promotional filming for Adam. From Bulawayo, Richard is not only a very good videographer, but excellent company, a hard-worker, and a talented and gutsy hunter. Although I kept a daily dairy, given the number of animals taken in Lolkisale, I am resisting the urge to provide a day-by-day recap. 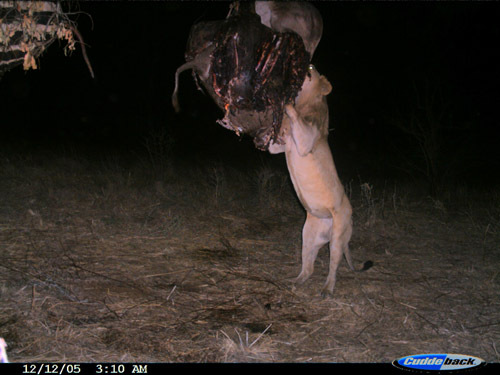 Instead, I will give an overview of the hunting highlights as best described by the trophy pictures (in no particular order), and try to continue highlighting aspects of the trip that others may find useful when setting up their own safari. Given the terrain and size of the concession, hunting on foot is not feasible, and drive/spot/stalk is the way it’s done. 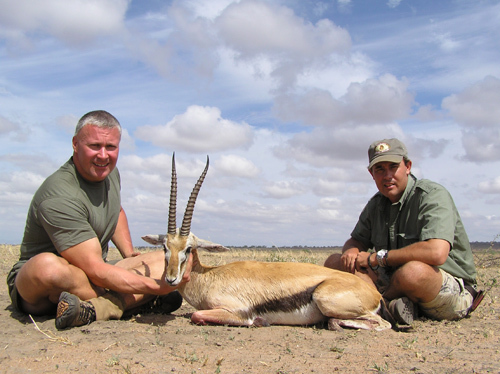 Shots ranged anywhere from 75 yards for the Bushbuck and Thompson’s Gazelle to 200-250 yards for the plainsgame such as the Cokes Hartebeest and EA Eland. But unlike anywhere I have previously hunted in Africa, on a whole the game was not at all skittish, especially the animals coming in from the Park. It was quite easy to drive up to some of the game without spooking them, however, once you got out it was a different story which was ideal as it made for some tedious and interesting short stalks. As it was late in the season, much of the concession had been burned in anticipation of the rains. The areas that experienced even brief showers quickly erupted in a sea of green grass, which would have been the case in the entire concession in more typical years with the Nov/Dec showers. Even given the lack of rain, game was literally everywhere and I had multiple shot opportunities on all plainsgame except Greater Kudu which I was not really after until the end of the trip when I realized how rare they still are in East Africa. We hunted some dry river beds, including one named the Sand River, which held game due to the thick cover and unburned grass. 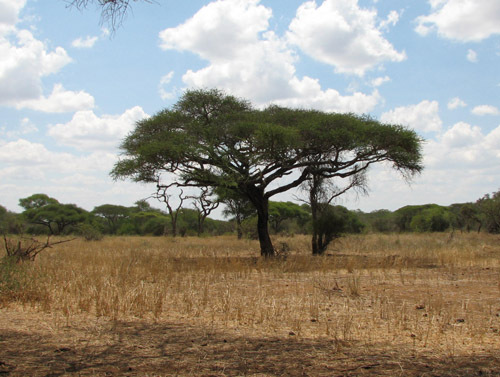 We also hunted the southern part of the concession, which according to Adam is where most of the game is located earlier in the season, looking for Lesser Kudu. But for the most part we drove the concession checking leopard and lion baits hung by Adam with the previous hunter, and put up a number of baits ourselves. Almost all plainsgame was taken incidental to this. 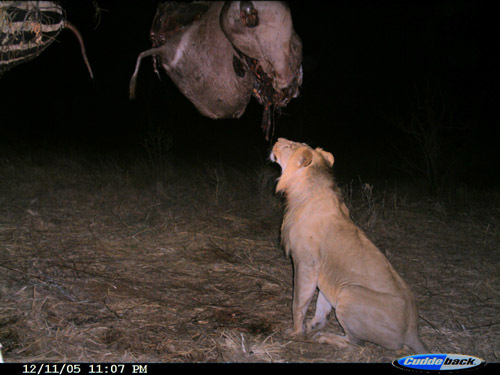 Lion was not my main focus, having taken a mature bush lion previously in the Luangwa Valley. However, the potential to shoot a terrific lion, plus the fact that Adam had one available and baits in the tree, made it too tempting to pass up. 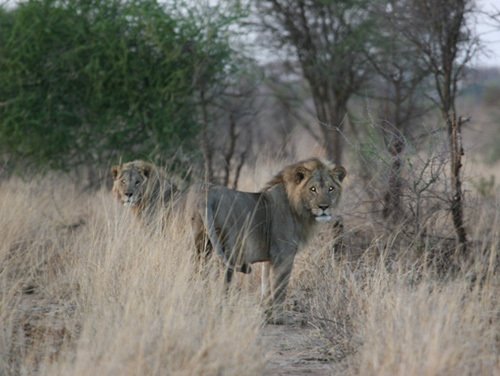 We actively hunted Lolkisale for lion less then two weeks, and I would encourage anybody going on a lion hunt to plan on staying all 21-days. Too many hunters expect quick success, and get disappointed and/or go home early. I’ve hunted lion three times, and was successful once. In this case, I was after something spectacular, and with the buffalo in the Park, we did not see any in the concession. If I could find the means, I would hunt Lolkisale again for lion, perhaps either in July or Nov/Dec. 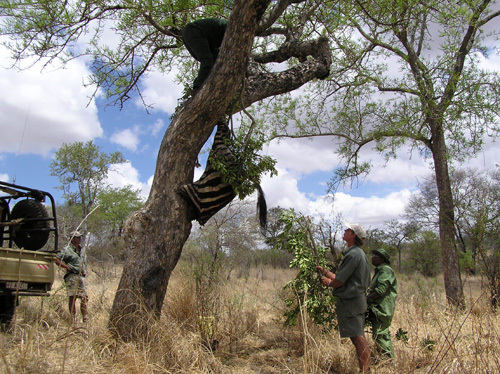 Hanging a Zebra quarter for lion bait. Two younger lions passed up by Adam and his client just prior to my arrival. These are images of a young male lion taken by a Cuddleback camera placed in a bush close to a lion bait. We had a hit on the bait and what appeared to be nice dark hair. We replenished the bait, hung the Cuddleback, setup a blind and sat that evening and following morning. I saw the flash of camera go off around 5:30am and thought we were in luck, but later learned that it was the female leopard as pictured below. As you can see, the lion was too young, a 3-4 year old male pushed out of the pride by the dominant male(s). One can debate the topic of using a camera, however, the reality is that time is limited and hunts are very expensive, and sitting on a bait without knowing the quality of the cat, or when it is feeding, is unproductive. I also think it helps the PH’s age the lions and avoid making mistakes in the field, which is particularly important in Tanzania these days with the age restriction (6 year old or better). Having sat in grounds blinds and machans, I found that using a camera does not change the dynamics of the hunt, or the intrigue and overall experience - and I personally wouldn’t hunt cats again without one. And, it’s just fun getting pictures like this!!! Pictures taken by the Cuddleback digital camera; note the times of the day stamped on the picture. I have now been on quite a few safaris, and have always thanked my lucky stars that to date I had not wounded and lost an animal. Not every shot was perfect (many were, including my previous leopard shot through the heart with a .416 at 100-yards), and I had my share of clean misses, but all game hit was recovered. Well, that win streak, just like USC’s, came to an abrupt end. I do not know what happened, I had a perfect site picture, was not nervous, had a good rest, squeezed the trigger, didn’t lift my hear (I don’t think), and picked out a spot low on the shoulder. Maybe too low, as previously the gun I was using (a camp .375 w/a Leupold 1.5-5 scope) shot low for me on a zebra and at a target set up on a tree at about 75-yards. However, Richard shot it perfectly, so I believe it was sited in. 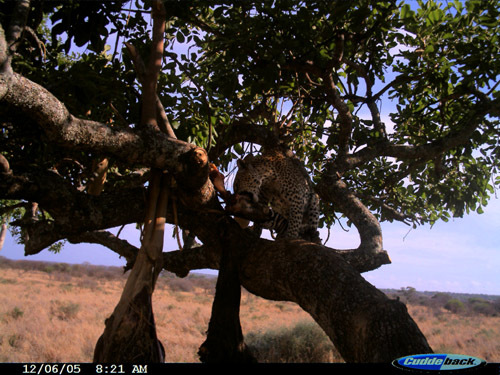 At the shot, the leopard jumped from the tree and headed for some thick brush. We heard a few growls (which we later learned was likely directed at a porcupine), waited a few minutes, and went in after him. This was very exciting, and I felt comfortable with my .458 Lott in hand (sans scope) and knowing that Adam had his .470 double and Rickard a shotgun loaded with buckshot. Unfortunately, the cat snuck away, and all we found was a bit of blood where he had laid, outside of a borough occupied by a porcupine (which we thought was the leopard until we dug him out!). Realizing this, we tracked him about a mile down a stream bed, and jumped him again in some bush, almost shooting a female that he was with by mistake, but he tore off seemingly unscathed. I wanted to go after him, but it was pointless, too much time had passed and he was clearly not going to stand and fight. I always wondered how a kicker feels when he misses the game-winning field goal - something he has done successfully hundreds or thousands of times before in practice and in games - letting himself and his teammates who worked so hard down. I now know…absolutely terrible, awful, never want to shoot another living creature ever again type of horrible. I am still beating myself up for this, and “yes”, it was recorded with the Tanzania Game Department in the trophy register, and I paid the trophy fee. Man this was hard to write….but let the chips fall where they may. Picture of the leopard taken by the Cuddleback digital camera. 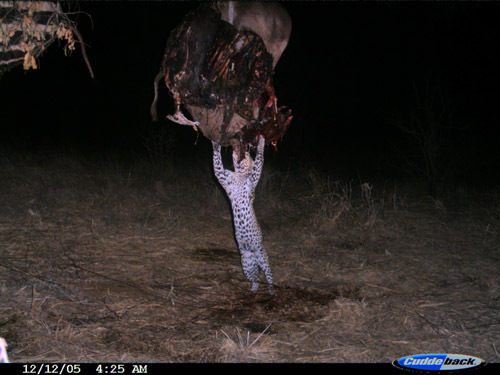 These are pict’s of a female leopard on the bait. Note the absence of a “sack” which confirmed that there were two leopard feeding and that one was a female (versus a young male), and when they were coming in. We spotted a small herd just before dark, the wind was good, so we followed them for about a mile before they finally stopped at the far edge of a clearing in some brush to look back at us. The glowing yellow sun was to our backs and this likely distorted our outlines as there was just some scrub for cover, otherwise as eland typically do they probably would have kept going. 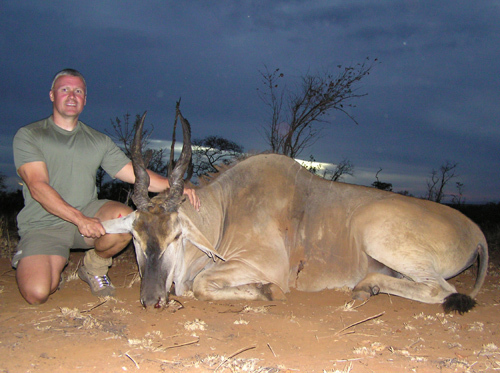 Fortunately I was able to quickly pick out the big bull and took a rather long shot, noting that eland are big targets. The 180gr TSX hit him well mid-body and exited on the far shoulder. He bucked at the shot and trotted off, but quickly laid down. I put a mercy shot in him and just before darkness was able to take a few pictures. 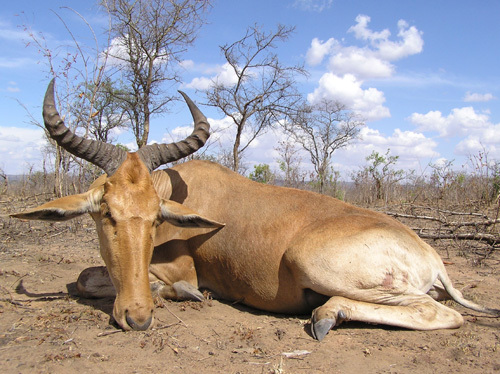 We tracked several herds of hartebeest unsuccessfully until this old lone bull appeared while checking lion baits. Having shot Red Hartebeest in South Africa and Lichtenstein’s in the Selous, I think that the Coke’s is the most striking with the neatest horn configuration. This was a big bull, with horns measuring 18.75 and 19 inches with 10.25 inch bases. We shot another one needed in a hurry for leopard bait which was slightly smaller but still very nice. The backstraps of course stayed with us, I like most game meat, but hartebeest is my absolute favorite. Although we had seen tracks at the bait sites, and heard their “whoooop’s” almost nightly, this was the only one seen, and a true target of opportunity. 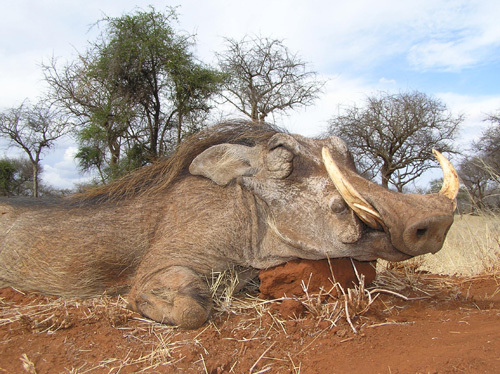 The picture below is of a young warthog he killed and was reluctant to leave, which was his demise. 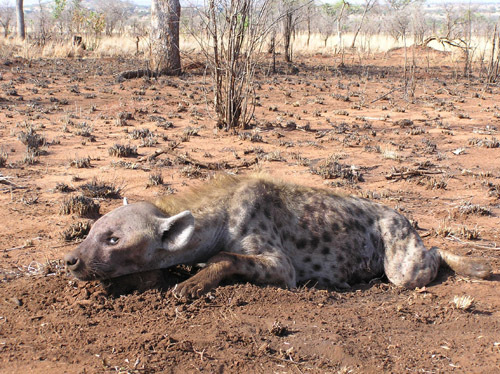 The trophy fee for hyena in Tanzania is a very reasonable $295. 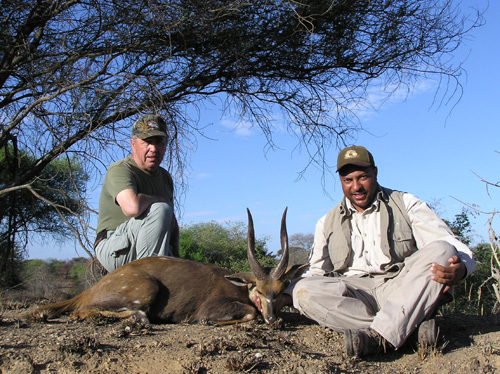 Taken on the last day, this was a nice impala significantly larger then those I had shot in South Africa. We saw quite a few rams, however, being among the last hunter of the season I think most of the larger ones had been taken. I am going to do a European mount and have the skin made into a flat rug. 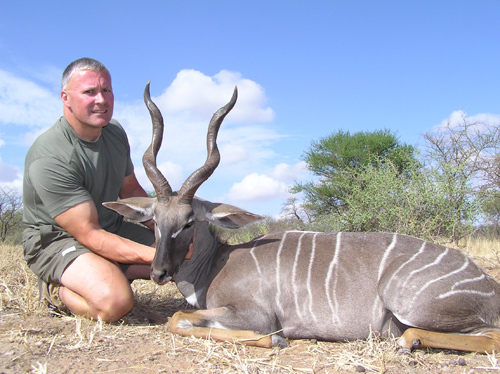 Along with Bongo, Lord Derby Eland and Sitatunga which I have yet to hunt and likely never will, the Lesser Kudu was one of the animals which I most desired, and being fortunate enough to shoot this grand trophy was the highlight of my trip. This bull was spotted from the truck at a distance, and was stalked totally unaware of our presence. I had to take a 150-175 yard shot through some brush (with the old 7x scope), but thankfully broke his front shoulder, anchoring him until a follow-up could quickly be placed through the spine. Although thought to be slightly bigger when first spotted, he was a mature bull with worn horns, tipped in and fully developed, measuring just under 24 inches, and I’d take him again in a heartbeat. And with great markings, he will make a terrific addition to the trophy room when full-mounted. Although I knew there were some Bushbuck in the area, I didn’t expect us to have an opportunity on one. We hunted this one twice, the first time he managed to sneak away in typical Bushbuck fashion. However, being territorial, we kept looking for him in the same area, and nailed him given a second opportunity. We didn’t realize what a terrific trophy he was until later. Rowland Ward minimum for an East African Bushbuck is 15”, and this guy was a bit worn down from age but still measured 15.5 and 15.25” with 6.5” bases. Another PH in camp commented that one like this had not been shot in the area for 20-years, which I don’t know if is correct but sure puts it in perspective. Another unexpected surprise, this animal probably represents the most significant trophy shot on the safari, as it was the first Thompson’s Gazelle legally hunted in Lolkisale in at least the last 10-years. We had seen a few females and young males, but Adam’s jaw literally dropped when he was this ram. I made a good lung shot on him at about 100-yards, but he still ran about half that before dropping. Clearly moved by this, Adam explained to me that of all the animals, the Thompson’s Gazelle is most special to him, calling it his “Black Rhino”. A bit of background from my own perspective…The area where these are being seen is in the north of the concession on the dirt track heading to Arusha. Because of the accessibility, it has been hunted over the years by resident hunters, with and without proper licenses to hunt the area. I do not mean ANY disrespect to the hunters of Tanzania, as they have every right to hunt in their own country just as we do in our own countries, but as was pointed out by another AR member who is from Tanzania, the resident hunter (unlike sport hunters) tend to hammer certain areas pretty hard. Eventually the animals just disappear, as was seen in the open areas on the way into the hunting concession which according to Peter used to hold considerable game. This is NOT the case with Lolkisale - which is full of animals - as evidenced by all the trophies I took on a relatively short hunt. But, at a distance to an untrained eye, a Tommy looks sort of like a Grants which kind of resembles an Impala (which are on many licenses). 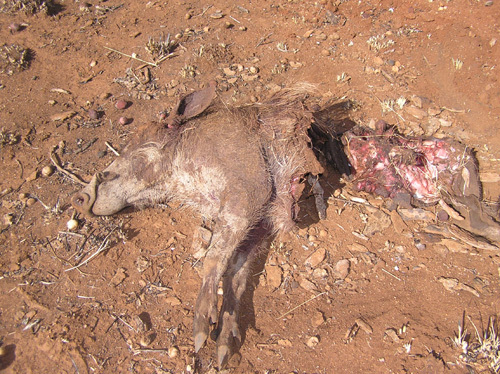 In an effort to curb this, Bundu has established an aggressive anti-poaching campaign. 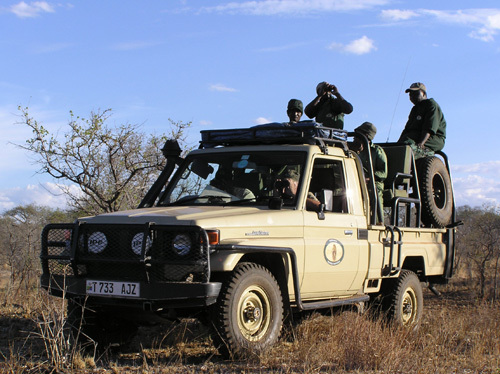 Known on the radios as “Chaca-1” and “Chaca-2”, the two armed teams patrol the area year-round, and have caught a surprising number of illegal/improper hunters, as well as poachers and locals gathering wood for charcoal to be sold as cooking fuel in Arusha. Chaca-1 is headed-up by Dennis Horsely, Paul’s brother, who like Paul is a terrific guy. When not hunting and during the off-season, Paul will also be on anti-poaching patrol. Probably because the holidays were approaching, we stopped two separate hunting parties ourselves (one of which took a crack at an “impala” but missed, noting there were just Grants and Thompson females in the area) and quizzed a third group, none of which had the proper paperwork to be hunting in the concession. The net effect of this over time should be more game and better hunting. Which gets me back to the Thompson’s Gazelle, which is perhaps proof that the efforts and investment in people and vehicles is paying off. Although the numbers are low, and one should not anticipate shooting a Tommy in Lolkisale at this point, the future looks bright and who knows in a year or three. I must admit to feeling a bit guilty about shooting this animal, but am most appreciative and consider myself was very, very fortunate especially considering the reasonable trophy fee (same as a Grants). He unofficially measured 13.25” (RW is 14”) with 4.75” inch bases, and hopefully had an opportunity to pass on his genes to the future generations. He will be full-mounted and long cherished. This old guy was in the wrong place at the wrong time. Spotting him for the truck, Adam and I chased him for a good mile before he finally slowed and began to feed. 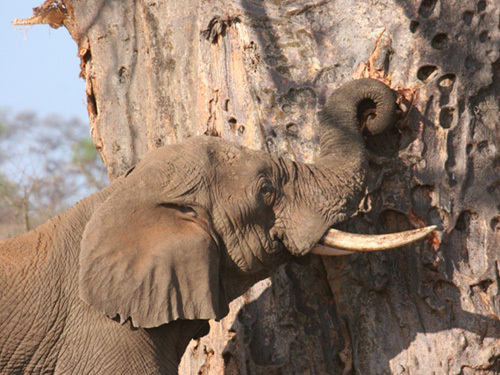 With the wind in our faces, we snuck up using a termite mound for cover but he busted us and took off. I shouldered the .300 and hit him on the trot at about 100 yards quartering away. The TSX traveled the length of the body breaking front and rear shoulders, and was found under the skin in the front left shoulder, one of only two TSX’s recovered. I’m a better shot in a scenario like this then I ever will be when shooting off of the sticks, with the whole gang looking over my shoulder. Although Masailand is not known for Waterbuck, especially the “common” variety, there were several good bulls in one particular area. I had not previously taken one, despite having hunted the Zambezi Valley, Luangwa Valleys and the Save Conservancy - all of which are known for nice Waterbuck. Part of the attraction was the very-reasonable trophy fee of just $680 which is far less then any of the other countries. He was shot at about 150 yards through the heart with a 180gr NorthFork, with Paul as the PH. 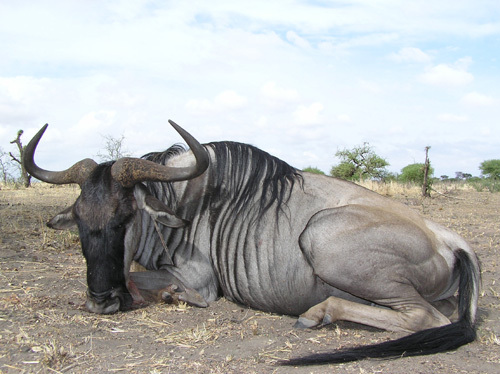 Before the trip, I was not really sure that I wanted to shoot a Wildebeest. After all, I had three on the wall, a Black and Blue that my son shot in South Africa, and a Nyasa that I shot in the Selous. However, the area was full of them allowing us to be rather selective, and of all the different flavors of Wildebeest, the White Bearded with it’s long white beard and coal-black mane is one of the nicest looking (for those of us that consider wildebeest and warthogs attractive!). Not a terribly exciting stalk, but I made a good lung shot and he died quickly, piled up under a bush after a short sprint, where he was bravely going to make his final stand. The last animal I needed was another zebra, but I found myself shooting this one for lion bait to replenish one that had been hit. A bit of advice regarding lion hunting…If one is hunting lion, one cannot be cheap on the bait animals, at least if one wants a reasonable shot at a nice cat. 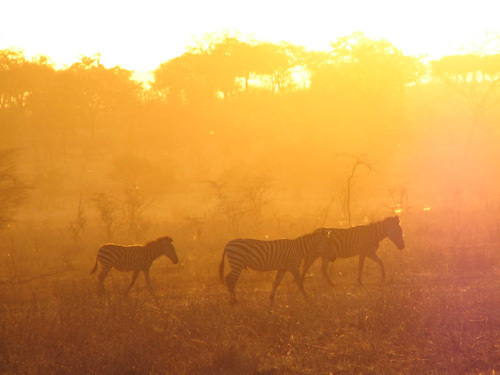 Like the zebra found in Zambia and down in the Selous, these Zebra have no shadow striping. He will be shoulder-mounted, noting that two I shot previously in Tanzania and Zambia were incorrectly caped. 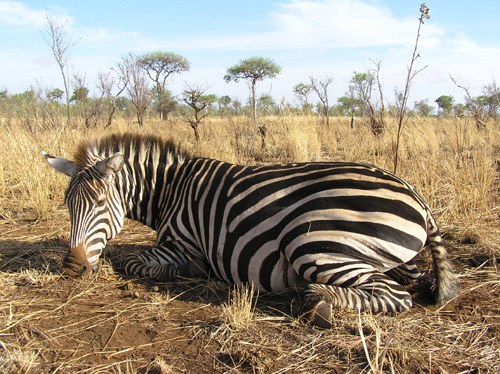 If anyone is planning on doing a shoulder mount of a Zebra, make sure to talk with the PH and skinner about this, as the skinners seem to be accustomed to cutting them up the front of the neck as would be done for a rug. Or, hunt w/Bundu, who caped it correctly without me asking. 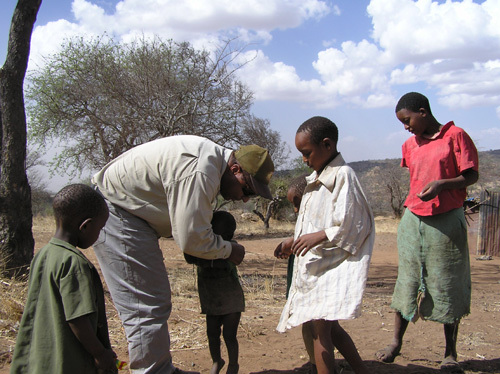 A very special part of any trip to Africa for me is the interaction with the local people, especially the children. 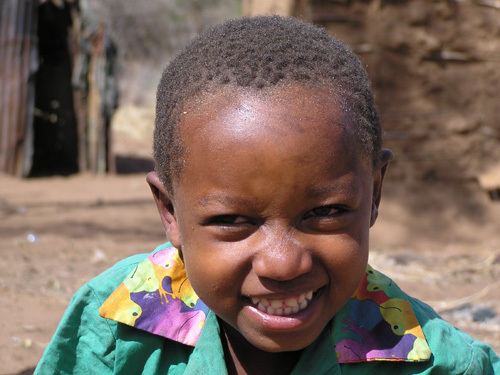 I had heard and read that the Masai in Masailand were no longer living primitive lives, that it was all a ruse. 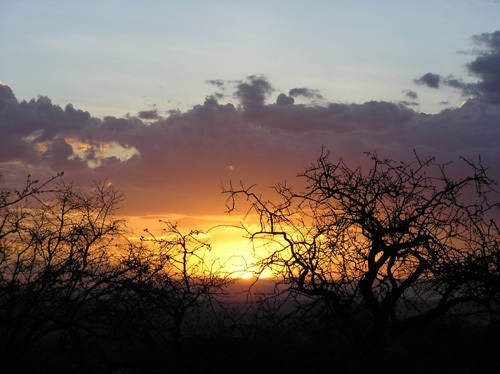 While this may be so in the touristy areas closer to Kilimanjaro, it is absolutely not the case in Lobo and Lolkisale. The Masai we encountered in the hunting areas are barely scraping by. According to Adam, since taking over Bundu, they have initiated a number of community service programs to help the local Masai, hoping also to strengthen relations and build trust. 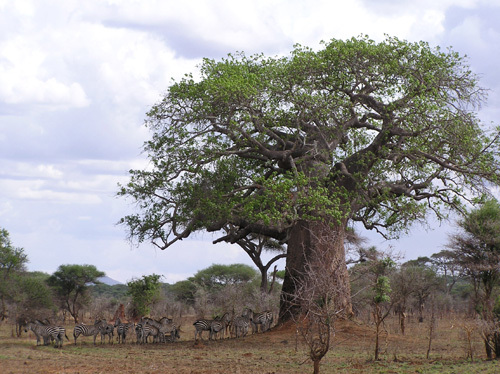 Lobo has more Masai (and goats) then Lolkisale due to the availability of water from the spring shared with the buffalo, and because of the relative absence of the tsetse flies which are more numerous in Lolkisale. Incidentally, after one impressive assault, Paul told me that they breed around full moon and that they need blood, which is why they were getting progressively worse as we approached full moon. Yet another reason to avoid this time of the month. I enjoyed seeing the Masai, and many times we would see Wildebeest, Zebra and other game in close proximity to the cattle. In Lobo, however, the Masai were rather near to camp as without the rains, this was the only place with browse for their huge herds of goats. 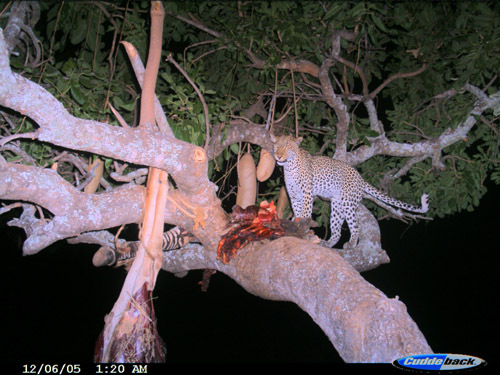 Again, this did not seem to disturb the game, including leopard which often snag a goat or two. In fact, Brian shot a nice leopard in this area on a bait left behind by Lee Lipscomb, who I had the pleasure of meeting in Lobo and have since stayed in contact with since returning home. The following pictures are from Lolkisale, we did not take any in Lobo figuring we had days to do so. 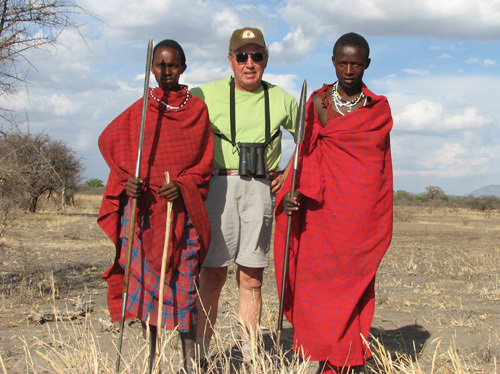 Bob with two young Masai encountered while I was off tracking something. They allowed him to take their picture in exchange for a bottle of water. A herd of cattle tended to by the Masai in Lolkisale. Paul told me that the local people do not own these cattle, but that they watch them for the village chiefs, and that when the rains come they will drive them back to reassemble into one big herd. 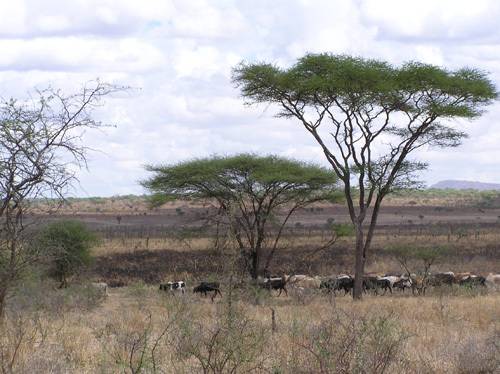 One of the only watering holes in Lolkisale, it is shared by the Masai and their cattle. 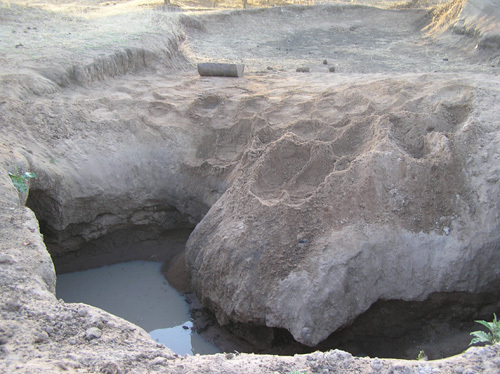 The water tables in Lolkisale are very deep, which makes digging holes for water, or camp wells, difficult. Not all people in the area are Masai. 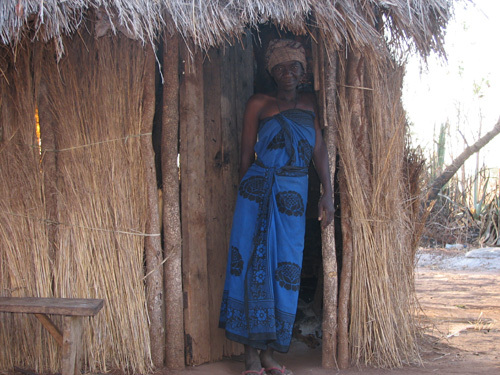 This woman and her husband tend a small plot of land where they raise crops during the wet season. 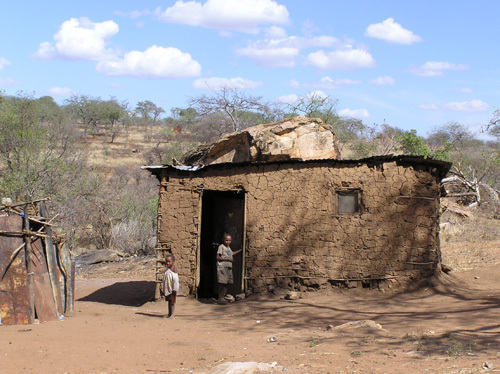 Paul and his six brothers and one sister were born and raised in this humble village located within the Lolkisale concession. Needless to say, Paul and his brother Dennis, who does anti-poaching for Bundu, know the area well. 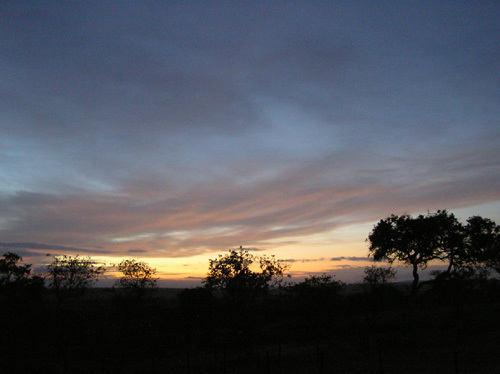 Another beautiful African sunrise. Located only ~250 miles south of the equator, you can literally watch the sun rise and set on the horizon. It’s over in the blink of an eye. 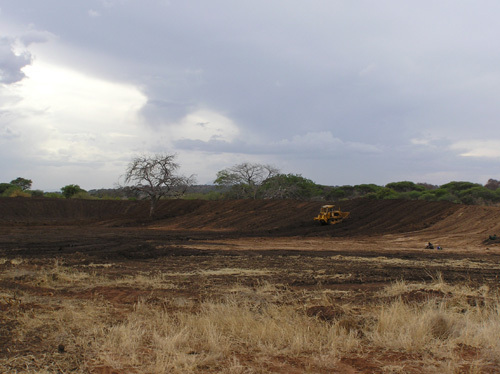 This is a picture of the dam that Adam is having built in the southern portion of Lolkisale, which is where most game is found during the early season (July). The hope is that it will hold water thereby increasing the carrying capacity of the area longer into the season. Two dugga boys that Adam & I passed up in Lolkisale early in the hunt. One was 41-42” with a deep curl - and very tempting - but a bit soft on top. I’m not sure how he would have looked come day 14! As it turned out, holding out for a true monster to come in from the Park, I did not shoot any buffalo in Lolkisale. Zebra could be found throughout the concession, and literally at times we would need to stop the truck until they finally moved from our path. A group of bulls, nothing over 25lbs, but to an “elephant hunter” like myself , neat to see nevertheless. 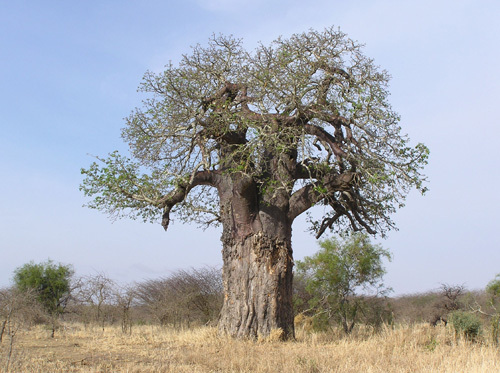 Elephant stripping bark from a baobab. 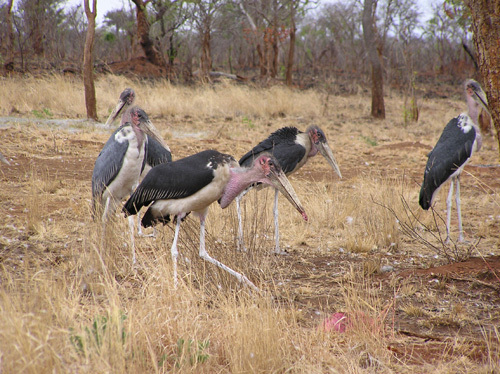 Lolkisale camp’s resident Marabou Storks. Are you a sunrise or a sunset person? In the beginning of the hunt, I am all about the sunrises. But towards the end, I appreciate the sunsets the most. This is a great picture which I plan to have framed and hung on the wall. With the safari over, we headed back to Arusha with “Gomi” who works for Tanganyika Trekker Safaris, which is owned by Tanzania Bundu Safaris and one of six companies licensed to operate in the Kilimanjaro National Park. Gomi is very energetic an easy to talk to, and is a wealth of knowledge. 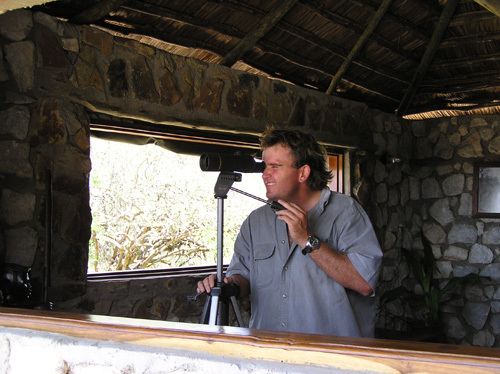 He conducts tours for couples, families and groups to popular destinations such as the Serengeti, Ngorongoro Crater, Lake Manyara, and even to the top of Mount Kilimanjaro (which is some 19,000 feet in elevation, or 3.5 miles!). In fact, Gomi will be guiding Richard to the top early next year to gather some video footage, which was an entertaining topic as Richard is already stressing over the climb and altitude, asking me for all sorts of training and nutritional advice. I don’t think Richard knows what excellent physical shape he is actually in. 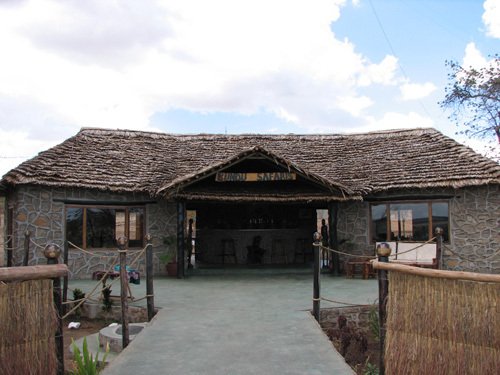 We arrived mid-afternoon in Arusha, after stopping at the Cultural Center for some “authentic Masailand souvenirs”. Afterwards we met Adam and Chantelle at the Mount Meru Lodge, enjoyed a few cold Kilimanjaro beers, and made our way to the airport for the flight home. The return KLM flight first goes down to Dar for a ~1 hour stop-over, then north to Amsterdam. Another wonderful, productive and eventful safari had come to an end. 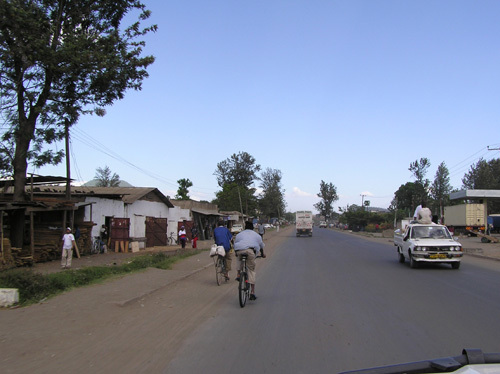 These pictures were taken of the outskirts of Arusha, on the main tar road heading to town. 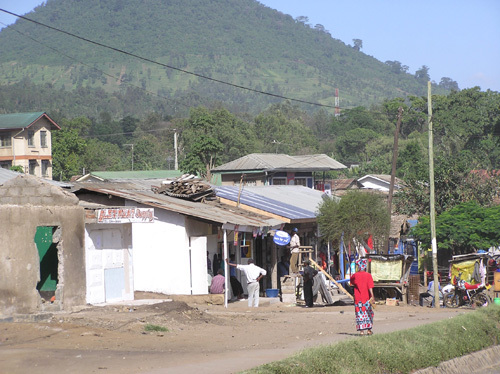 Note Mount Meru in the background, which stands in stark contrast to the hustle-and-bustle along the main road. 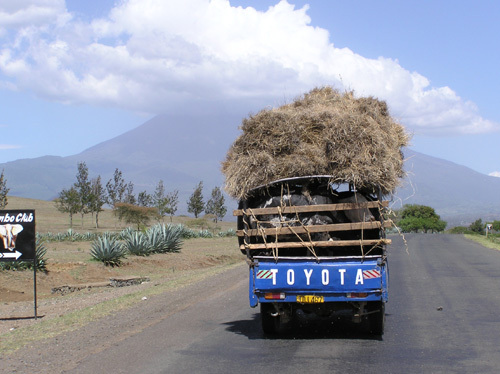 This is a classic - check out the cattle in the back of this compact Toyota pickup. This is often overlooked, but the way I look at it, the safari is not complete until my animals are home with me, although final payment to the outfitter has long been made. 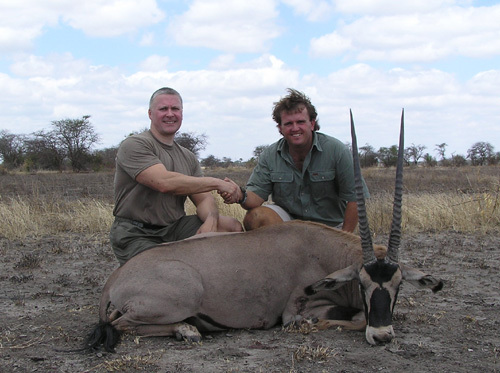 On my last Tanzanian hunt in 2001 with another operator, I waited 13 months for the trophies to ship, which in my opinion is way too long, but seems to be the norm with Tanzania especially with the sub-leased hunts where trophies sit until the end of the season before they are processed. My trophies from Zambia and Zimbabwe (which are in transit and was handled wonderfully by Buzz Charlton and Andy Hunter) took about 5-6 months, which is very reasonable. 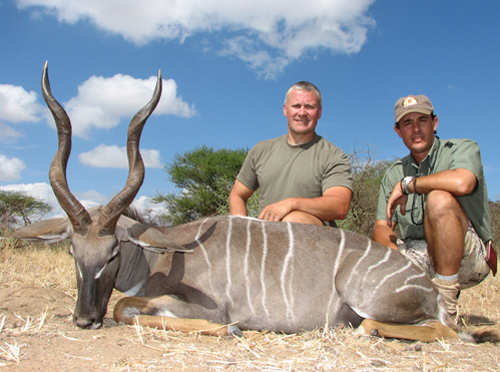 With Bundu Safaris, other members of AR have reported exceptionally quick trophy shipment, like as in a few months! As I was one of the last hunters of the season, I did get a chance to check out both skinning sheds, and there were very few trophies still there. According to Peter who oversees the crating and shipping, all but those taken on the very recent hunts had been shipped, and the day I left all remaining trophies including mine from both camps had been transported to Arusha. Peter is familiar with the new regulations regarding the usage of wooden crates, and all wood is treated and certified. 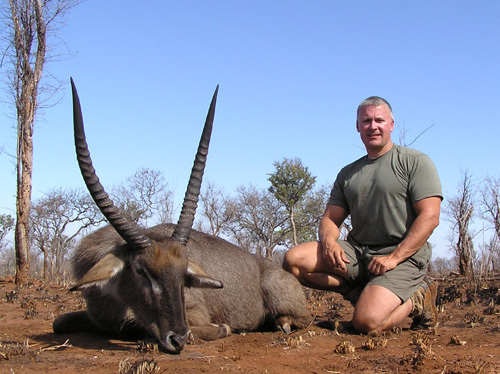 Most of my past hunts were specialized and for just a few animals and/or even no trophies at all, such as with a tuskless elephant hunt in Zim. But knowing that the trophies would be handled in an efficient and timely manner, and without fear that they would get caught up in some government red tape, I had the confidence to shoot more game for mounting. Although it will take me years to get everything mounted, I at least can get everything tanned (by Carolina Fur) and safely stored until I can afford the taxidermy work. First on the list is the Thompson’s Gazelle and Lesser Kudu (both full mounts), followed by the Grants, Eland and Oryx. I will update this report when the trophies are received, including exact shipping costs. Given the terrain, overall this was not a terribly physical hunt. However, being in shape adds to the enjoyment of any hunt in my opinion, and lessons the impact of travel - and the strain on the body related to changes in sleep pattern, diet, climate, and altitude (Lolkisale is at ~5000ft elevation). I had dropped about 30lbs for an elephant hunt with my two sons and friend/PH Buzz Charlton this past July, and my training for Masailand basically consisted of maintaining my new current weight via diet and weight training while continuing to improve my aerobic conditioning through road cycling. I used a Ruger Mark II in .458 Lott for the buffalo, with hand-loaded Woodleigh 500 grain softs and solids (83-84grns of IMR 4320, at ~2250fps out of the Ruger's 24" barrel). The Ruger is basically stock except for a Burris 1.5-6 Signature Series Posi-Lock scope, mercury recoil reducer in the stock, a 3/32 ivory front bead and a Decelerator pad. For the plains game I used my no-frills Winchester Model 70 .300 magnum fitted with a Swarovski 2.5-10x40 scope, which as described above developed some sort of problem and had to be retired. Bullets for the .300 were handloaded 180gr Barnes TSX and 180gr NorthFork’s. In past trips, I have routinely rented Iridium 9505 satellite phones from Outfitter Satellite, to stay in touch with my family and office. However, as Adam has several Thuraya phones in camp, I opted to use these and pay for the airtime. Saeed has said that their performance was superior to the Iridium’s, which I found was absolutely the case. Talking through the Thuraya was like talking via a cellular phone, with no background noise, painful delay, and most importantly zero dropped calls. And unlike the Iridium’s, I didn’t need to stand in the middle of a clearing to get a reasonable signal. Now don’t get me wrong, just being able to phone home and talk to my daughter from the bush is pretty terrific, but if you have the choice, go for the Thuraya providing that there is coverage in your destination, which currently does not include all of Southern Africa. 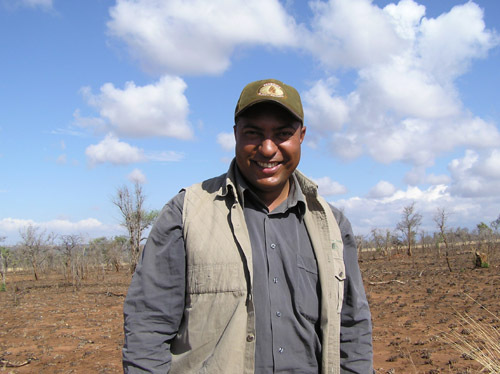 I believe Saeed has reported that he had coverage in the Selous, but I am not sure about areas like the Zambezi Valley where I consider a satellite phone to be essential. I would appreciate hearing of other’s experiences with the Thuraya elsewhere in southern Africa. My father-in law and I took along nutritional snacks, which unlike on previous hunts was not really necessary, but I like having something to throw in the truck bag for mid-day energy. I prefer Clif bars (from rei.com), low fat peanut butter for sandwiches, and crushed walnuts and raisins for the morning "porridge". And of course we took some candy including lollipops, which always lightens the mood on the back of the truck. Anticipating seasonably warm, hot weather (65-70 evenings to 80-95 degrees Fahrenheit daytime temps) and rain showers, other essential equipment included: Boyd Gators; packable rain poncho, Ex Officio Buzz-Off long sleeve shirt and zip-off light hiking pants (highly recommended, available from LL Bean and others in season), Columbia Water Trunks (I really liked these, no tears or pulls and very comfortable); cotton shorts from Columbia; Duofold VariTEC "dryfit" shirts ($4-10/ea from campmor.com); broken-in light-hikers from Merrell; Smartwool socks; Avon Skin-So-Soft w/SPF-15 (I forgot a good 30+ SPF sunblock and lip balm)and a Westley Richards cartridge belt. Medicines taken along but not necessarily used included Larium (which I stopped taking due to fever/chills following two doses, not sure what I’ll use in the future), Doxycycline, Cipro, Advil, Tylenol, Benadryl, nasal decongestant, Imodium, Ambien, multi-vitamin and prescription medication (Singulair for allergies). The digital camera used for all pictures was a 2 year old 4-megapixel Olympus C-750 UltraZoom, with four memory cards totaling 1000MB (1GB) of storage and two sets of rechargeable 2500mAh batteries plus a DC charger that could be used in the Cruiser. I took a total of 500 digital pictures. Lacking the knowledge, patience and ability to use the camera to its fullest potential in manual mode, I took multiple pictures using the various automatic settings (auto, landscape, portrait, and the best one landscape plus portrait). My father-in law used a new Canon PowerShot S2-IS 5mp camera, and it was reassuring to know that as most times he was taking the same picture as me, the chances that one of us would get a nice shot was pretty good. Adam has Dell notebook PC’s for the PH’s to use, and the ability to burn CD’s or DVD’s from all memory cards right there in camp. This is highly recommended as the data stored on memory cards is susceptible to loss, and it is critical to make copies as soon as possible. When you get home it is okay to transfer the data to your PC’s hard drive, but ALWAYS have additional copies on CD or DVD as a backup. In my opinion, Tanzania Bundu Safaris is a first class operation with a finger on the pulse of what we as hunters are looking for. They own the exclusive rights to these two concessions, and with any luck will be adding more areas in the future. There is a lot of momentum behind the company, and well financed, they are investing heavily in the area, equipment, people and camps - clearly thinking long-term. According to the PH’s their anti-poaching and crack-down on illegal resident hunting is already having a positive effect on the quantity of game. Although this is likely ruffling a few feathers, the company appears to have friends in the right places. This is one of the few organizations and destinations in Africa where I would personally have no problem putting a deposit down for a hunt 2 to 3+ years off in order to get my dates. And I might just do that.